Winemakers, or oenologists, plan, supervise and coordinate the production of wine or spirits from selected varieties of grapes. This involves overseeing the growth, harvest, crushing, fermentation, clarification, aging, blending and bottling of grapes. They might work for small estates and perform a variety of tasks, or they may specialise in a single area at a large winery. Winemakers may perform the following tasks: liaise with viticulturists, who manage planting, cultivation and production of grapes; monitor the progress of grapes and determine the time for harvest; organise the crushing and pressing of grapes; direct the filtering of wine; conduct laboratory tests and monitor quality of wine; place filtered wine in casks or tanks for storage and maturation; prepare plans for bottling; supervise cellar personnel; supervise the maintenance of the vineyard and winery during the off season; liaise with sales and marketing staff; organise and supervise local and export wine sales; conduct technical in-service training; give guided tours and conduct tastings. Why did you choose this profession? Winemaking combines creativity, science and passion. It is an art form, in its own respect. It challenges you immensely; every harvest is different and you are sometimes completely at the mercy of Mother Nature. The profession offers you a platform from which to express your skills and talents, from organisation and planning to leadership, time management, people skills, problem-solving, and the list goes on. The industry is always changing, growing and evolving and so you have to as well, in order to adapt and move forward as a person and as a professional. What training did you undergo? After high school, I completed a four-year BSc Agricultural Science degree at the University of Stellenbosch, where I specialised in Viticulture and Oenology. However, it is extremely important to further your studies and enrol in as many short courses as you can, from marketing, to public relations, laboratory skills, financial planning, scientific writing and so on. What characteristics ‘make’ a winemaker? You need to be passionate about and respectful towards wine. Most of my social life revolves around the industry and wine-related events. You need to be adaptable, hard-working and not be afraid to get dirty! During harvest the hours are intense. This year I clocked up over 300 overtime hours between January and March. You have to be able to lead, but also be able to follow. A great sense of responsibility is key, as well as a fast-thinking and problem-solving mindset. Nothing is too great to overcome! Experience vs formal training? The knowledge gained with each harvest only makes you a better winemaker. No one is great when they start out. Greatness is built daily, weekly, monthly, yearly. Every mistake results in you becoming more conscious, and each success builds your confidence and should drive you to always want to do more. Describe a typical day on the job I can break this up into two periods: harvest and after harvest. During harvest, we start at 6am, if we are bringing in grapes on that day, and at 8am if we aren’t. On the days that grapes arrive for processing, the cellar is cleaned, which includes washing tanks and equipment; hygiene is very important. After we have processed the grapes and the juice/grape must is in the tank, we do analysis and make the various necessary adjustments. Then we clean again. A typical day when receiving grapes during harvest can last until 11pm. For red wines, we do pump-overs and punch-downs generally every two hours. This is a 24-hour practice, until the wine has completed fermentation. After harvest, we focus on keeping the wines healthy with monthly analysis, moving wines from tank to barrel and ensuring that all legal paperwork is completed. What do you like most about your job? My job is so interesting – not only does it involve making wine, but also teaching/guiding students, which forces me to keep my knowledge fresh and updated. At the Elsenburg Agricultural Training Institute, we have a max of 20 students every year that complete their final year of training to become winemakers. I also enjoy all the wine events that I am able to attend, and the platform to meet people. Your career highlight so far? A working exchange to Burgundy, France, in September 2013. The love, respect and reverence with which wine is treated in Burgundy was something that completely changed my way of viewing wine and also encouraged me to give more, in terms of educating people on wine appreciation. Why did you choose this profession? I was offered a scholarship by SAA. 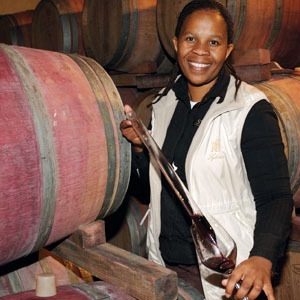 I was given the option of studying something else but, after gaining some hands-on experience working at Delheim, I developed an interest in winemaking. What training did you undergo? I completed a BSc in Agriculture, specialising in Viticulture and Oenology (the art of winemaking). During my study period, I completed an internship at Delheim. I’ve also been to France to visit their wineries and to take part in harvests there. What personality traits does a winemaker need? You need to be outspoken, passionate and patient (results take time). You need to be a good communicator, to be able to take criticism and – hopefully – understand the reason behind it. You produce wine for the people, not for yourself, but you must also enjoy the wine you produce. If you like it, your passion for it will be contagious! Is experience as important as formal training? Yes, studying doesn’t present you with the real-life problems you experience on the job. Describe a typical day on the job There is no typical day – it largely depends on the season. During harvest time I’m running up and down checking grapes and overseeing the crushing, fermentation and pressing. Or I’m organising when grapes should come in for crushing, or preparing the barrels for wine when fermentation is complete. During the off season I’ll be tasting, participating in shows, visiting clients and doing my paperwork. What do you enjoy most? I have no favourite part… all the parts make up the whole, so I embrace everything. When it’s time to visit clients, I enjoy getting out of the winery; when I arrive back I get to make wine, play and have fun. I like the variety my job offers. I like watching someone drink my wine, or imagining them doing so on the other side of the world. I also love working with my cellar team: they’re the best. What advice would you give to someone starting out? I’ve noticed that when people want to become winemakers, they have an idea in their heads and often focus only on the fun aspects of the job. In reality that’s actually just the cherry on top. You have to be realistic – start at the bottom and work up. Cleaning and admin form part of the job. Winemaking is hard work, but rewarding. The basic requirement for entry into the occupation of winemaking is a Bachelor of Science: Agriculture degree with a specialisation in Viticulture and Oenology. There are also relevant diplomas available for study. Some wineries will hire people whose major has been in another field, such as food technology or chemistry, provided courses in oenology have been included in the programme. Training in business and public speaking are also valuable background for prospective winemakers. All students are required to work on wine farms for at least one season.